Recognized as one of the most innovative and disruptive companies in freight. 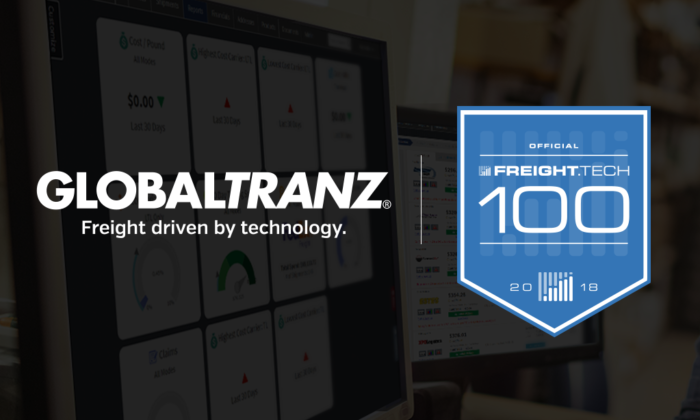 PHOENIX (October 30, 2018) – (BUSINESS WIRE) – GlobalTranz Enterprises, Inc., a leading technology-driven freight management solutions provider, has been named to the Freight.Tech 100 by Freight Waves, recognizing the most innovative and disruptive companies in logistics. Out of more than 500 companies nominated, GlobalTranz earned a spot on the list among other technology industry leaders like Amazon, Tesla and Waze. FreightWaves is regarded as the leading technology and freight market source. The Freight.Tech 100 inaugural list recognizes the most innovative companies that are driving digitization and disruption in the freight and logistics industry. Nominations for the list were sought, and a panel chosen by the FreightWaves Research Institute narrowed the list of more than 500 nominations down to the top 100 companies. “The Freight.Tech 100 represents the most innovative companies across the freight industry, and took into consideration a number of factors including the amount of capital raised, various rankings and recognition to date, and their current impact,” commented Arlen Stark, FreightWaves’ EVP of Research. Ranked a Top 10 freight brokerage in the US by Transport Topics and voted an Inbound Logistics Top 10 3PL for 2018, GlobalTranz is driving strong growth with 25,000+ customers through technology innovation, a network of 34,000+ carriers, transformative M&A, creative products and superior customer service delivered by the best people in the industry. For more information on the Freight.Tech 100 list by FreightWaves, visit www.freightwaves.com/freighttech-100-companies. For more information about GlobalTranz, visit permissible-script.flywheelsites.com and follow us on LinkedIn and Twitter @globaltranz.